Please use the form below to register your Holley brand product. 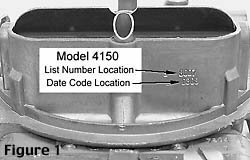 The List number for a Model 2010, 2300, 4010, 4011, 4150, 4160, 4165 or 4175 carburetor can be found on the right side of choke air horn. 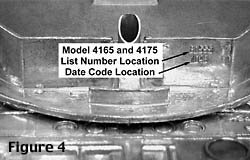 The List number for the 4500 can be found on the top of the main body casting. 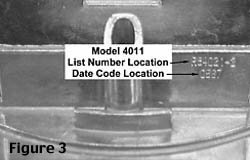 Below the list number is a date code that will contain no more than four (4) digits. See Figures below. Thank you for purchasing product(s) from the Holley family of brands. 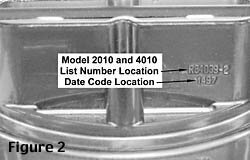 Register your product to make your warranty return process as easy as possible. Some products even qualify for our 1 Year Extended Warranty. To Help us understand our Customers lifestyle, Please indicate the interest and activities in which you or your spouse enjoy participating on a regular basis. I purchased this product primarily because... Uncertain of the company reputation. of my previous experiance with your company. the price was right. it had just the right features. it had the look I wanted. it's what the shop recommended. it's what my friends and family recomended. your company has the best warranty. of your commercial. 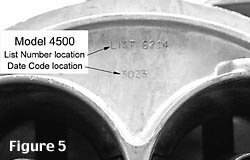 of an article I read on the product. my mechanic thought it best. of a sale/special the shop was running.